93 Brandon CRS, GRI, ABR, SRES UNDER CONTRACT UNDER CONTRACT Bobby Drew Mayer 910-617-5336 • Michelle Wheeles 910-382-0611 • Pam Parrish 910-262-1738 Bobby Brandon 910-538-6261 910-538-6261 • bobbyb@intracoastalrealty.com • www.BobbyBrandon.com www.wrightsvillebeachmagazine.com WBM 900 Saltwood Lane • $489,000 3/4 bedrooms plus FROG Craftsman style home. Creekside at Porters Neck. Boat ramp. 1721 S. Moorings • $260,000 Landfall Golfcourse lot with views of pond 1303-B N. Lumina • $759,900 4-bedroom, 3-bath condo One block to ocean, Wrightsville Beach 819 S. Lumina Avenue • List price $2,150,000 50’ x 178’ oceanfront lot. Selling agents. 421 Highgreen Dr. • $315,000 4 bedroom, 3 bath. Craftsman style home in Bayshore Estates. Rights to community boat ramp. 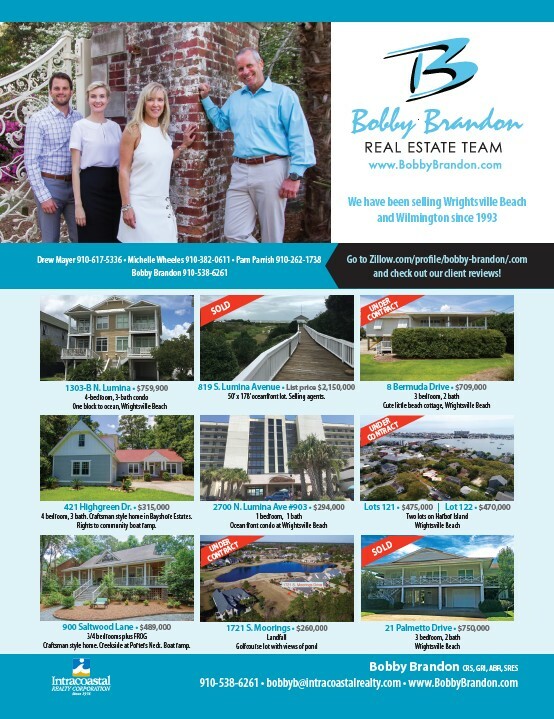 8 Bermuda Drive • $709,000 3 bedroom, 2 bath Cute little beach cottage, Wrightsville Beach Lots 121 • $475,000 | Lot 122 • $470,000 Two lots on Harbor Island Wrightsville Beach 2700 N. Lumina Ave #903 • $294,000 1 bedroom, 1 bath Ocean front condo at Wrightsville Beach 21 Palmetto Drive • $750,000 3 bedroom, 2 bath Wrightsville Beach SOLD SOLD UNDER CONTRACT We have been selling Wrightsville Beach and Wilmington since 1993 Go to Zillow.com/profile/bobby-brandon/.com and check out our client reviews!